Earlier this year Dilly-Dali Art , made these beautiful rainbow pour painted pots. I had it on my list of projects to do with the kids, but of course, I never got around to it. Then a few weeks ago I saw that In Lieu of Preschool did the same type of painting but on pumpkins! So I went out and bought the supplies and the kids had the greatest time creating and designing their own rainbow colored pumpkins. Hmmmm….I wonder what else can we pour paint on??? In Lieu of Preschool first cleaned their pumpkins with a wet rag and then a dry one. They then spray painted the pumpkins thinking it would allow the paint to adhere better. I didn’t have any spray paint off hand, but I did have some Mod Podge clear acrylic sealer. In Lieu of Preschool wasn’t even sure the spray paint was necessary, but I didn’t want to take any chances so I sprayed some of the clear acrylic sealer on the pumpkins after I cleaned them. After the pumpkins were dry, I took out our acrylic paints and glitter. They do sell acrylic paints with glitter already in them, however we didn’t have any, and I didn’t want to make a special trip to Michaels just for acrylic glitter paint. I set the pumpkins up on disposable Tupperware as it was the only thing that I had off hand. In Lieu of Preschool re-purposed old applesauce containers to elevate her pumpkins. It definitely helps speed the drying process so your pumpkin isn’t sitting in wet paint. You will see in a picture down below just how much paint starts to run off the pumpkin. Have the kids start squeezing away with the paint. I definitely recommend having lots of paint as the kids will go through it quickly. I think I added 3 or 4 more bottles in addition to the ones pictured above for my kids to use. We started by pouring paint on the stem and letting it flow down, but paint was collecting in the little crevice near the stem, so my son started pouring paint on the sides of the pumpkin. You can’t really tell in the photo, but he’s trying to show her how to paint on the outside parts of the pumpkin. The pumpkins already look so pretty! And the kids were only half way done. After the kids were done with the paints, we poured glitter on the tops of the pumpkins. I then let the paint dry for a few hours, and then I sprayed clear acrylic sealer over the entire pumpkin. It gave it a nice shiny look. The neighbors definitely admired our pumpkins! 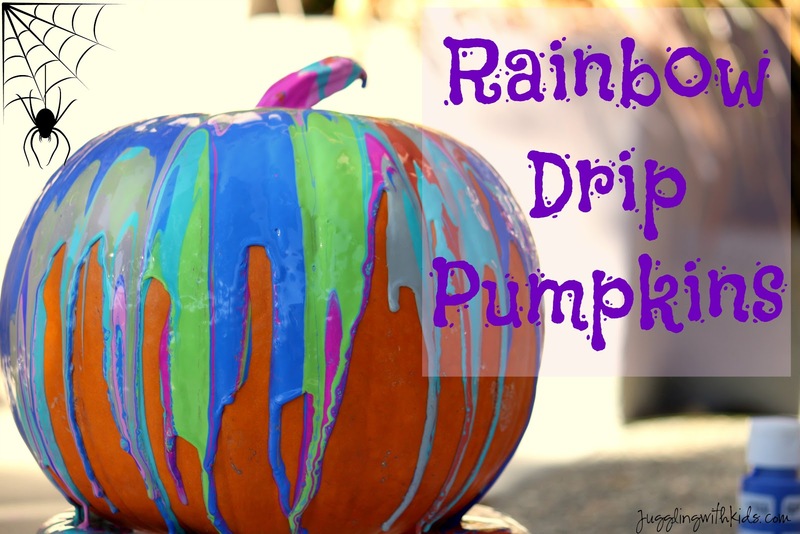 And their children wanted to make their own rainbow drip pumpkins as well. This was definitely a fun project that we’ll be doing again! I adore these! I am blown away by how easy they were to make yet how eye catching they are. The addition of glitter would have been a big hit in my house. Pinning and sharing on our FB page. Will the pumpkins still rot with the sealer on? I would hate to throw them away!